Try our Natural Lapis Lazuli Carvings & Gifts Satisfaction Guarantee - compare our prices and our superior quality. Select any genuine lapis lazuli carving or other handcrafted lapis lazuli gift item's image below to enlarge it. This piece of natural lapis lazuli has beautiful deep blue natural color. 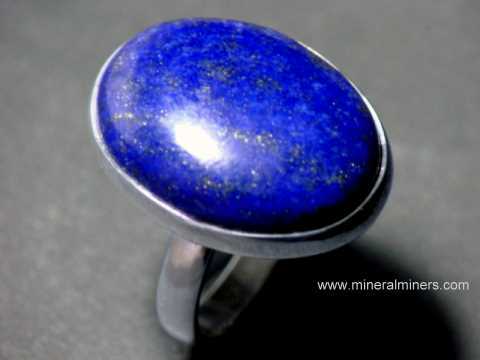 It was handground & polished after being mined at the ancient lapis lazuli deposits high in the mountains of Afghanistan. The blue color is very intense with lenses and spots of white calcite and golden pyrite within the deep blue lapis (all 100% natural color). Lapis Specimen Dimensions: 4" x 2" x 1.5"
This unique piece of natural lapis lazuli has beautiful deep blue natural color. It was handground & polished on all surfaces. The fine blue color is in very intense layers with some layers showing white calcite and beautiful golden pyrite together within the deep blue lapis (all 100% natural colors). Lapis Specimen Dimensions: 5" x 1.7" x 1.6"
This unique piece of natural lapis lazuli has beautiful deep blue natural color. It was handground & polished on all surfaces. The fine blue color is very intense with some layers showing white calcite and beautiful golden pyrite together within the deep blue lapis (all 100% natural colors). Lapis Specimen Dimensions: 3.4" x 2.2" x 1.7"
This piece of natural lapis lazuli has very beautiful very deep blue natural color! It was handground & polished after being mined at the Skazar Mine in Afghanistan. The blue color is very intense with thin lenses and spots of white calcite and brilliant golden pyrite within the deep blue lapis (100% natural color). Lapis Specimen Dimensions: 5.5" x 4" x 0.9"
This unique piece of lapidary grade natural lapis lazuli has a relatively flat shape with deep blue natural color. It was handground & polished on all surfaces. The fine blue color is very intense with some layers showing white calcite and beautiful golden pyrite together within the very fine quality deep blue lapis (all 100% natural colors). Lapis Specimen Dimensions: 4.8" x 2.7" x 1.8"
This unique specimen of natural lapis lazuli has beautiful deep blue natural color with thick layers of fine cabochon grade! It was handground & polished on all surfaces. The fine blue color is very intense with layers of white calcite and disseminated golden pyrite within the deep blue lapis (all 100% natural colors). Lapis Specimen Dimensions: 4.3" x 2.7" x 2.6"
This unique specimen of natural lapis lazuli has beautiful deep blue natural color. It was handground & polished on all surfaces. The fine blue color is very intense with some layers showing white calcite and beautiful golden pyrite together within the deep blue lapis (all 100% natural colors). Lapis Specimen Dimensions: 6.2" x 5.5" x 1.4"
This unique piece of natural lapis lazuli has a relatively flat shape with very deep blue natural color and very large areas of fine lapidary grade. It was handground & polished on all surfaces. See also an opposite side view of this lapis lazuli decorator specimen. The fine blue color is very intense with some layers showing white calcite and beautiful golden pyrite together within the deep blue lapis (all 100% natural colors). Lapis Lazuli Decorator Specimen Dimensions: 5" x 4.5" x 1.9"
This natural lapis lazuli decorator specimen has lapidary grade layers with very rich deep blue natural color. It was handground & polished on all surfaces. The blue color is very intense with some layers of white calcite and golden pyrite within the deep blue lapis (all 100% natural colors). See also an opposite side view of this wonderful decorator specimen of natural color lapis lazuli. See also a view of this beautiful lapis lazuli decorator specimen laying down on its side. Lapis Specimen Dimensions: 7.1" x 5.8" x 1.9"
This unique piece of natural lapis lazuli has amazing fine deep blue natural color! It was handground & polished on all surfaces. See also an opposite side view of this lapis lazuli decorator specimen. The fine blue color is very intense with some layers showing white calcite and beautiful golden pyrite together within the lapidary grade deep blue lapis (all 100% natural colors). Lapis Mineral Specimen size: 7" x 4.9" x 1.9"
This unique specimen of natural lapis lazuli has thick layers of beautiful deep blue natural color of fine cabochon grade! It was handground & polished on all surfaces. The fine blue color is very intense with layers of white calcite and disseminated golden pyrite within the deep blue lapis (all 100% natural colors). See also an opposite side view of this lapis lazuli decorator specimen. Lapis Specimen Dimensions: 11" x 5.7" x 1.4"
This large size piece of natural lapis lazuli has amazing fine deep blue natural color! It was handcrafted into this eleven inch long relatively flat shape & then polished on all surfaces. See also an opposite side view of this large lapis lazuli decorator specimen. The fine blue color is very intense with some layers showing white calcite and beautiful golden pyrite together within the lapidary grade deep blue lapis (all 100% natural colors). Lapis Specimen Dimensions: 15" long x 5.2" x 3"
This unique decorator specimen of natural color lapis lazuli is 15 inches long! It has amazing fine deep blue natural color. This beautiful decorator specimen was handground & polished on all surfaces. See also an opposite side view of this large lapis lazuli polished decorator specimen. The fine blue color is very intense with some layers showing beautiful white calcite and shiny golden pyrite together within the wonderful deep blue lapis (all 100% natural colors). 10.7 inch Lapis Lazuli Decorator Specimen! Lapis Specimen Dimensions: 10.7" x 2.7" x 1.8"
This unique specimen of natural lapis lazuli is 10.7 inches long! It has thick layers of beautiful deep blue natural color of fine cabochon grade! It was handground & polished on all surfaces. The fine blue color is very intense with layers of white calcite and disseminated golden pyrite within the deep blue lapis (all 100% natural colors). See also an opposite side view of this large lapis lazuli decorator specimen. Lapis Specimen Dimensions: 16" x 10.5" x 1.8"
This extra large size decorator specimen of natural lapis lazuli has fine deep blue natural color! This beautiful specimen was handground into a relatively thin flat shape & polished on all surfaces. The deep blue color is very intense, and there are some veinlets of white calcite and golden pyrite within the deep blue lapis (all 100% natural colors). See also an opposite side view of this natural color lapis lazuli decorator specimen. Lapis Specimen Dimensions: 8.5" x 8.5" x 2"
This rare quality decorator specimen of natural lapis lazuli has very fine deep blue natural color and it has very large areas of fine lapidary grade on both the front and back! It was handground & polished on all surfaces. The deep blue color is very intense, and there are some layers and thin veinlets of white calcite and golden pyrite within the deep blue lapis (all 100% natural colors). See another view of this rare collector quality specimen of natural color lapis lazuli. See also an opposite side view of this fine quality specimen of natural color lapis lazuli. 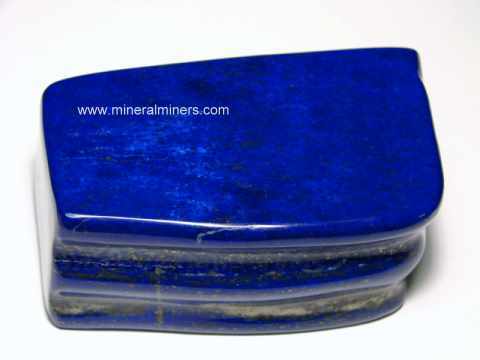 See a side view showing the layering in this natural color lapis lazuli specimen. See another side view showing the layering in this lapis lazuli decorator specimen. Lapis Lazuli Carving Dimensions: 4.5" long x 2.2" x 2.2"
This unique carving of natural lapis lazuli beautiful deep blue natural color. It was carved & polished by hand! The natural blue color is very rich with layers and veinlets of white calcite and golden pyrite flecks within the rich blue lapis (all 100% natural colors). 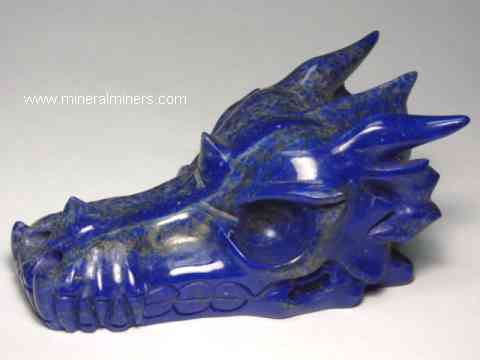 See also an opposite side view of this superior quality lapis lazuli dragon head carving. Lapis Lazuli Carving Dimensions: 4.3" long x 3.5" tall x 3"
This lapis lazuli tiger carving has very beautiful deep blue natural color. There are two tigers circling each other with one clawing at the other's back. They were very well carved & polished by hand from a single block of natural lapis lazuli! The blue color is very rich with areas of white calcite and lots of wonderful golden pyrite flecks within the rich blue lapis (all 100% natural color). 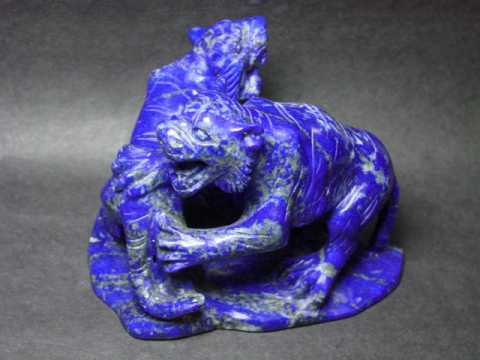 See also an opposite side view of this natural color lapis lazuli tiger carving. This lapis lazuli sphere was hand-ground and polished from natural color lapis lazuli rough of superior quality cabochon grade that was mined in Badakshan, Afghanistan. This 3.3 inch diameter lapis lazuli sphere was hand-ground and polished from natural color lapis lazuli rough of superior quality cabochon grade that was mined in Badakshan, Afghanistan. The photo at left was taken under incandescent light. This lapis lazuli sphere was hand-ground and polished from natural color lapis lazuli rough of superior quality cabochon grade that was mined in Badakshan, Afghanistan. The photo at left was taken under incandescent light. This 3.8 inch lapis lazuli sphere was hand-ground and polished with a superior quality finish from natural color lapis lazuli rough with layers of cabochon gem grade that was mined in Badakshan, Afghanistan. The photo at left was taken under incandescent light. This lapis lazuli sphere was hand-ground and polished with a superior quality finish from natural color lapis lazuli rough with layers of superior quality cabochon grade that was mined in Badakshan, Afghanistan. The photo at left was taken under incandescent light. Lapis Lazuli Lingham, 8.5 inches long! This large size lapis lazuli lingham was hand-ground and polished from natural color lapis lazuli rough with layers of white calcite, golden pyrite and superior quality cabochon grade lapis that was mined in Badakshan, Afghanistan. 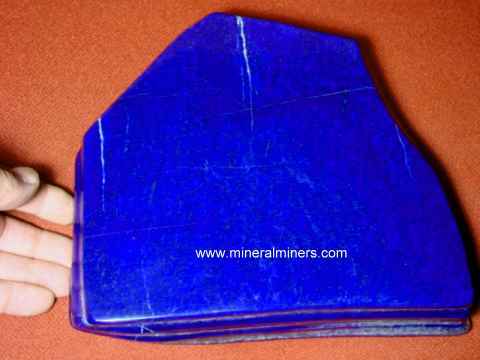 See an opposite side view of this natural color large lapis lazuli lingham. See also a top view of this large size large lapis lazuli lingham. See also a bottom side view of this genuine lapis lazuli lingham. Lapis Lazuli sphere, 6 inch diameter! Natural lapis lazuli sphere weighing 11.5 Lbs! This rare size lapis lazuli sphere was hand-ground and polished with a superior quality finish from natural color lapis lazuli rough of cabochon grade that was mined in Badakshan, Afghanistan. The photo at left was taken under incandescent light. This natural lapis lazuli pendant was handcrafted in sterling silver and set with two oval shaped cabochon gems of natural color lapis lazuli measuring 9x6mm and 12x10. This pendant will make a wonderful lapis lazuli necklace! The lapis has a fine quality finish with very beautiful deep blue natural color and golden pyrite flecks. This natural lapis lazuli pendant was handcrafted in sterling silver and set with two cabochon gems of natural color lapis lazuli, a 6mm square cushion and a 21x13mm pear shape. The lapis is untreated and has a fine quality finish with very beautiful deep blue natural color and golden pyrite flecks. This natural lapis lazuli pendant is set with two untreated cabochon gems of natural color lapis lazuli, a 10x8mm oval shape and a 22x18mm. The lapis has a fine quality finish with very beautiful deep blue natural color and golden pyrite flecks. This natural lapis lazuli jewelry design was handcrafted in 925 sterling silver. This natural lapis lazuli pendant was handcrafted in sterling silver and set with three untreated cabochon gems of natural color lapis lazuli; a 7mm round, an 9x7mm pear shape and a 17x13mm oval shape. This natural lapis pendant will make a very nice lapis lazuli necklace! The lapis has a fine quality finish with very beautiful deep blue natural color and golden pyrite flecks. 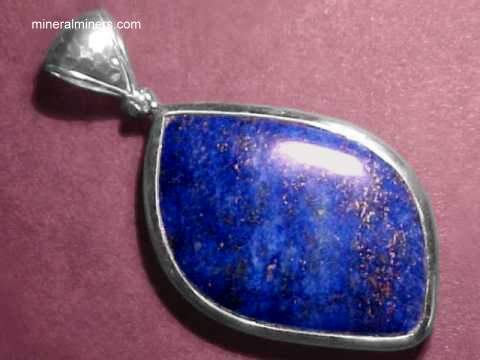 This genuine lapis lazuli pendant was handcrafted in sterling silver and set with three oval shaped cabochon gems of natural color lapis lazuli measuring 7x5mm each. The lapis is a very beautiful dark blue with golden pyrite flecks. This pendant is also set with two faceted gems of natural white topaz; one is an oval shape 7x5mm, the other is a 6x4mm pear shape. This beautiful pendant is also set with a 5mm diameter genuine freshwater pearl. This natural lapis pendant will make a lovely lapis lazuli necklace! This large lapis lazuli pendant was handcrafted in 925 sterling silver and bezel set with an open back setting under the natural lapis lazuli gem. It is set with a 25x19mm cabochon gem of natural lapis lazuli. The lapis is a beautiful natural color blue with some shiny golden pyrite flecks. The 18 inch sterling silver necklace is included at no extra cost! This extra large lapis lazuli pendant was handcrafted in 925 sterling silver and bezel set with an open back setting under the natural lapis lazuli gem. It is set with a 30x20mm cabochon gem of natural lapis lazuli. The lapis is a beautiful natural color blue with shiny golden pyrite flecks. The 18 inch sterling silver necklace is included at no extra cost! This extra large lapis lazuli pendant was handcrafted in 925 sterling silver and bezel set with an open back setting under the natural lapis lazuli gem. It is set with a 36x29mm cabochon gem of natural lapis lazuli. The top surface of the lapis is a beautiful natural very deep color blue with some golden pyrite flecks. The 18 inch sterling silver necklace is included at no extra cost. This fine quality lapis lazuli pendant was handcrafted in 925 sterling silver and bezel set with an open back setting under the huge natural lapis lazuli gem. It is set with a 61x31mm cabochon gem of natural lapis lazuli. 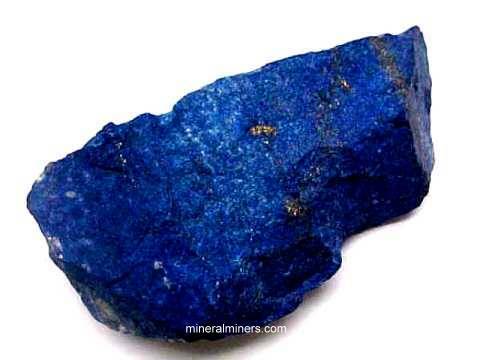 The lapis is a beautiful natural very deep color blue with some golden pyrite flecks. The 18 inch sterling silver necklace is included at no extra cost. This natural lapis lazuli pendant was handcrafted in sterling silver and set with three untreated gems of natural color lapis lazuli, a 6mm round, an 14x7mm marquis shape and a 28x12mm pear shape. 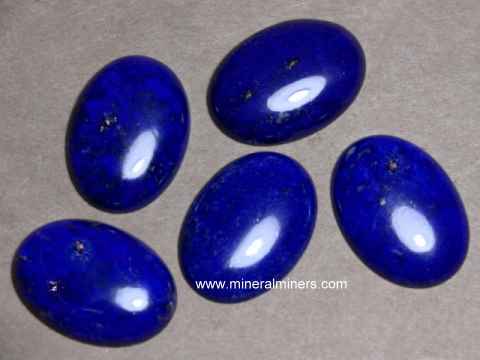 The lapis cabochons have a fine quality finish with very beautiful deep blue natural color and golden pyrite flecks. This natural lapis lazuli pendant is set with a 36x26mm cabochon gem of natural color lapis lazuli. The lapis has a fine quality finish with very beautiful deep blue natural color and golden pyrite flecks. This genuine lapis lazuli jewelry design was handcrafted in 925 sterling silver and bezel set with an open back setting under the natural lapis lazuli gem. This natural lapis lazuli pendant was handcrafted in sterling silver and set with two oval shaped cabochon gems of natural color lapis lazuli, a 9x7mm and a 26x20mm. This genuine lapis lazuli jewelry design was handcrafted in sterling silver. The lapis has a fine quality finish with very beautiful deep blue natural color and golden pyrite flecks. This pendant will make a wonderful lapis lazuli necklace! This fine quality lapis lazuli pendant was handcrafted in sterling silver and set with cabochon gems of natural color lapis lazuli. These genuine lapis cabochons measure 9mm round, a 15x10mm oval and a 13x10mm pear-shape. This genuine lapis pendant will make a wonderful lapis lazuli necklace! The lapis lazuli has a very beautiful dark blue natural color with golden pyrite flecks. This fine quality pair of lapis lazuli cuff links was hand-crafted in sterling silver and set with 13x10mm oval shaped cabochon gems of natural color deep blue lapis lazuli. Each of the cuff links also has a 3mm round cabochon gem of natural lapis lazuli mounted on each end of the cross-piece. The photo at left is viewed under incandescent light. Extra Large Lapis Lazuli Necklace! This unique lapis lazuli necklace was hand-crafted in 925 sterling silver. The lapis was hand ground and polished from natural lapis lazuli with layers of very fine quality natural color lapis lazuli rough with beautiful golden flecks of sparkling pyrite. The oval cabochon gems measure from 29x17mm up to 35x23mm, and the pear shape gem measures 26x18mm. The photo at left shows a close-up view. 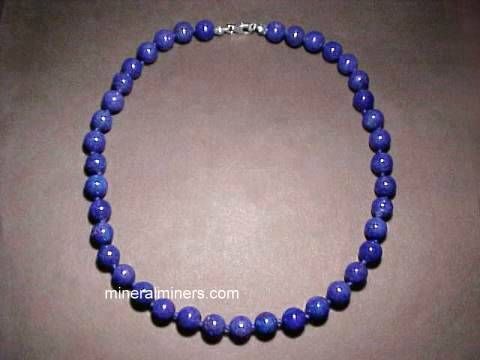 See another close-up view of this natural color lapis lazuli necklace. See also a full view photo of this extra large size lapis lazuli necklace. This unique lapis lazuli necklace was hand-crafted in 925 sterling silver. The lapis was hand ground and polished from natural lapis lazuli rough with beautiful golden flecks of sparkling pyrite into extra large size cabochon gems measuring from one 20x15mm up to 42x27mm! The photo at left shows a close-up view. See also a full view photo of this extra large size lapis lazuli necklace. This unique lapis lazuli ring was handcrafted in sterling silver and set with a 22x16mm oval shaped cabochon gem of natural lapis lazuli. The lapis has beautiful deep blue natural color with shiny golden pyrite flecks. This unique lapis lazuli ring was handcrafted in sterling silver and set with a 27x21mm oval shaped cabochon gem of natural lapis lazuli. The lapis has beautiful deep blue natural color with shiny golden pyrite flecks. This extra large lapis lazuli ring was handcrafted in a heavy sterling silver ring style and set with a 30x20mm oval shaped cabachon gem of natural lapis lazuli. The lapis is a beautiful natural color blue with shiny golden pyrite flecks. See also another view of this extra large natural lapis lazuli ring. This unique lapis lazuli ring was handcrafted in 925 sterling silver and bezel set with an open back setting under the natural lapis lazuli gem. It is set with a 37mm x 34mm pear shaped cabachon gem of natural lapis lazuli! The lapis is a beautiful natural color blue with white calcite and shiny golden pyrite flecks. The 16x12mm oval shaped cabochon gems in these natural lapis lazuli earrings have very beautiful dark blue natural color with some golden pyrite flecks. 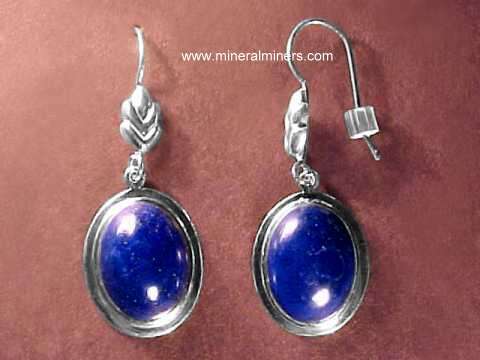 These lovely lapis lazuli earrings were handcrafted in fine 925 sterling silver. The 18x13mm cabochon gems in this pair of natural lapis lazuli earrings have very beautiful dark blue natural color with some golden pyrite flecks. These lovely lapis lazuli earrings were handcrafted in fine 925 sterling silver. These genuine lapis lazuli earrings each measure 2.3" long! The cabochon gems in this pair of natural lapis lazuli earrings have very beautiful dark blue natural color with some golden pyrite flecks. These lovely lapis lazuli earrings were handcrafted in fine 925 sterling silver. The square cabochons measure 12mm across, and the pear shape gems are 13mm long x 10mm wide. Each of these handcrafted lapis lazuli earrings measures 2.3 inches long! This genuine lapis lazuli bracelet has tumble polished natural lapis lazuli pieces with beautiful blue color. These genuine lapis lazuli beads were drilled and strung on an elastic band fitting all wrist sizes up to size 8. Natural lapis lazuli bracelet with over 100 carats of lapis beads! Beautiful beads of genuine lapis lazuli with fine blue natural color are strung on an elastic band fitting wrist sizes up to size 8 1/2. These genuine lapis lazuli bracelets were hand-crafted from natural lapis lazuli rough that was mined in Afghanistan. These barrel shaped lapis lazuli beads measure 12mm long (1/2 inch long). They are genuine lapis lazuli beads with fine natural color containing beautiful shiny flecks of golden pyrite and small amounts of white calcite. The photo at left shows a close-up view. See also a full view photo showing several of these natural lapis lazuli bracelets. Natural lapis lazuli bracelet with over 175 carats of fine lapis beads! Genuine lapis lazuli beads with fine blue natural color are double drilled & strung on elastic bands fitting wrist sizes up to size 8 1/2. The photo at left shows a close-up view. See also another view of this natural lapis lazuli jewelry design. These natural lapis lazuli bracelets were hand-crafted from genuine lapis lazuli rough that was mined in Afghanistan. These flat square shaped lapis lazuli beads measure 15mm across (0.6 inch square cushion shape beads). They are genuine lapis lazuli beads with fine natural color containing beautiful shiny flecks of golden pyrite and small amounts of white calcite. See also a full view photo showing several of these natural lapis lazuli bracelets. This natural lapis lazuli bracelet was hand-crafted in sterling silver with a tall profile and set with six giant size natural color lapis lazuli cabochon gems measuring 30x25mm at each end of the bracelet and the largest center stone measures 42x32mm! This genuine lapis lazuli is natural color, with beautiful shiny flecks of golden pyrite. 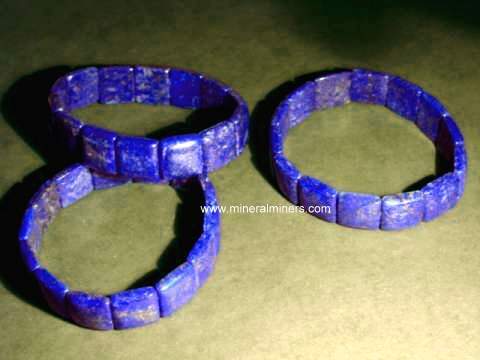 The photo at left shows a close-up view of this extra large lapis lazuli bracelet. See also a full view photo of this natural lapis lazuli jewelry design. This beautiful lapis lazuli bracelet was hand-crafted from natural color lapis lazuli rough that was mined in Afghanistan and then set in sterling silver. These pear shaped lapis lazuli cabochon gems are gradational in size ranging from 26x21mm at each end up to 36x27mm in the center of the bracelet. 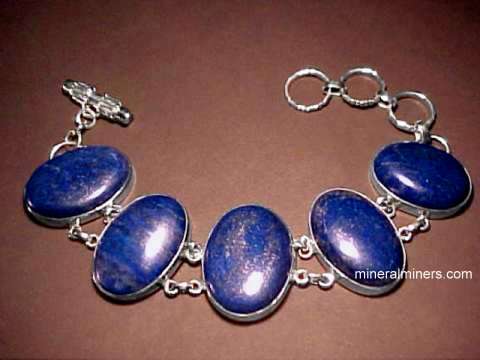 This genuine lapis lazuli bracelet is natural color, with beautiful shiny flecks of golden pyrite. The photo at left shows a close-up. See also a full view photo of this natural See also a full view of this genuine lapis lazuli jewelry design. Our Lapis Lazuli Gift items were all handcrafted from natural lapis lazuli rough! Each one of our lapis lazuli handcrafted items is genuine untreated natural lapis lazuli! We specialize in 100% natural lapis lazuli items. We have a large selection of shapes and sizes available of very beautiful high quality natural lapis lazuli rough pieces that make great mineral specimens for collections just as they are, although these high grade lapis lazuli rough specimens will make very fine lapis lazuli carvings, cabochon gemstones, and spheres. Our genuine lapis lazuli jewelry is handcrafted in sterling silver into lapis lazuli rings, pendants, necklaces, bracelets and earrings. We have a very large selection of collectable handcrafted gifts available in dozens of natural mineral varieties! To see more lapis lazuli photos, just follow any link below. For more information about natural lapis lazuli and its history, physical properties, chemistry, occurance, and metaphysical uses be sure to see our lapis lazuli information page. 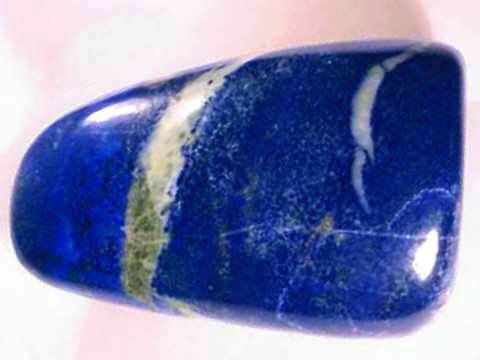 To see more lapis lazuli items for sale, just select any image shown below. We have been working with natural lapis lazuli for over 30 years, and we have a large inventory of genuine lapis lazuli items in stock! 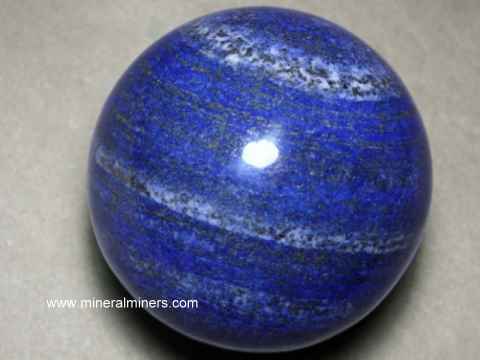 We offer the following genuine lapis lazuli products; lapidary grade lapis lazuli rough specimens, polished lapis lazuli decorator mineral specimens, lapis lazuli cabochon gems, lapis spheres, lapis lazuli carvings, and a variety of genuine lapis lazuli jewelry items. Be sure to let us know if you have any natural lapis lazuli requests. Would you like us to inform you when we add on this page more handcrafted stone carvings, polished specimens and other gift items in natural lapis lazuli? We have over 150 tons of gem & mineral items in stock at our mineral warehouses, so be sure to let us know if you have any special requests.